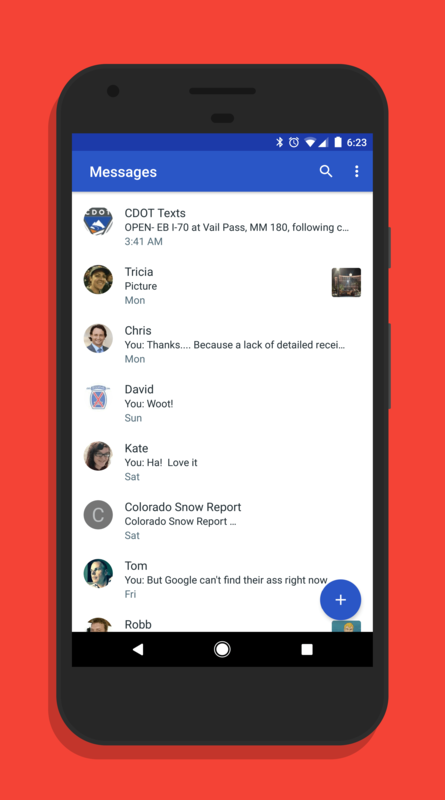 Google has begun rolling out an update to their text messaging client, Android Messages. The update, version 2.2 for those keeping score at home, has a few minor UI tweaks but the big news is around group messaging. With this new update, when you are in a conversation with someone via SMS, you can add another person quickly and easily to the conversation. To do this, while you are in a conversation, go to the overflow menu (the three vertical dots) then tap on People & Options. At the bottom of this page there is a button which you can tap to open up your contacts and add them to the conversation. This is a big improvement over the previous build which essentially required you to start an entirely new conversation for group messaging. This update also has added the ability to create a group message from the FAB (Floating Action Button) from which you can add your contacts to the conversation. Both of these improvements lower the number of taps required to start a group MMS. keyboard to continue typing. Also, the plus icon for adding media to a message has been updated to reflect the color scheme of the messages you have with that contact. Google is clearly pointing to Android Messages as the SMS/MMS client for users. With SMS now out of Hangouts (including for Project Fi customers which was suppose to stick around), it is the default client for texting. The question remains what they will do with Allo (which is rumored to be getting SMS support). Regardless, this update to the app is rolling out now and should hit your devices over the course of the next few days.